2011: Since I wrote this piece in 2006, there have been a number of changes at Wendling and in the Gressenhall benefice. 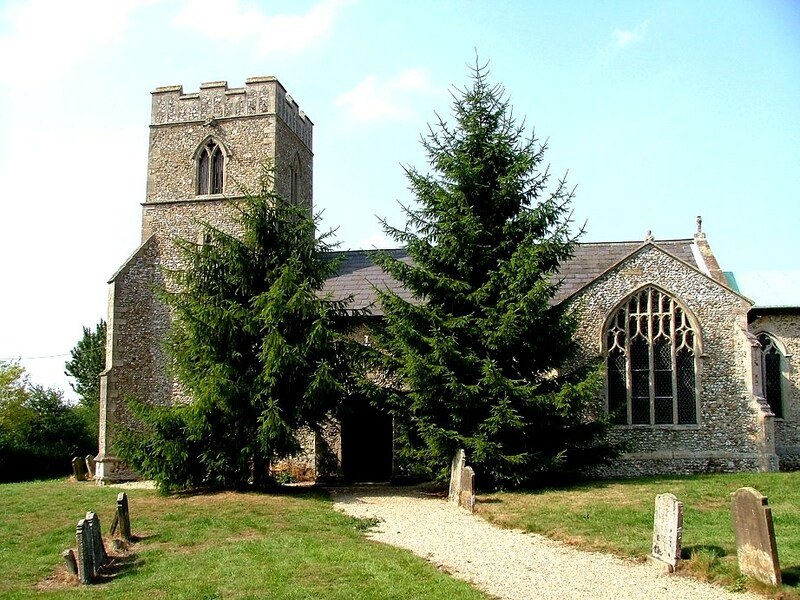 The current Rector of the benefice has politely asked me to make it clear to readers that the minister mentioned in the piece has since retired, and visitors are now welcome at Wendling. I am happy to do so, and I have altered the piece slightly to emphasise this. 2006: At almost the first sight of St Peter and St Paul, Wendling, I decided that it was typical of those inoffensive little churches which you find up back lanes near busy roads. You know the sort: a simple 14th century construction augmented a bit a century later, there's the sound of rushing traffic, the graveyard is an oasis in an agri-industrial desert, the door of the church is locked without a keyholder notice, and it doesn't really look as if it is used for anything from the end of one week to the next. 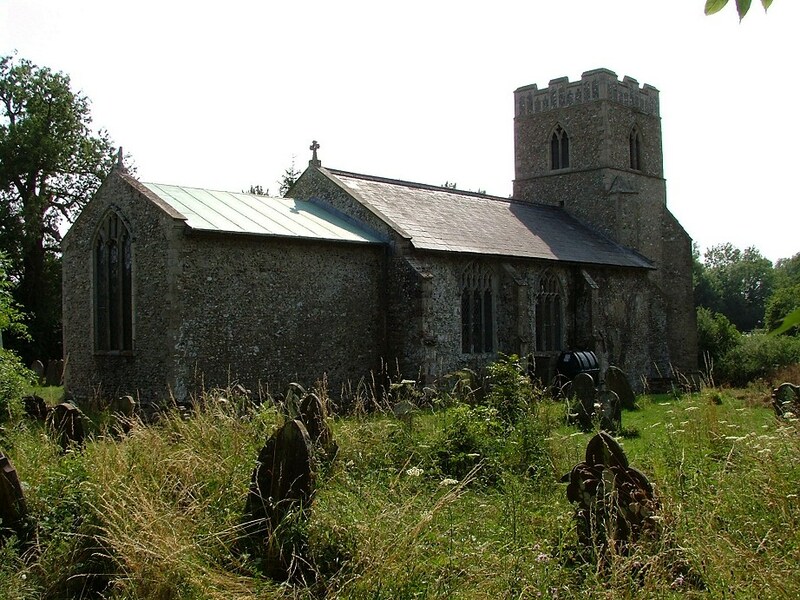 Fortunately, Norfolk does not have many churches like this. But St Peter and St Paul, Wendling, was one of them, it seemed to me. Unless you were being a completist, you might think that Wendling church is not worth the bother - and when I finally did get inside, I found myself signing the same page in the visitors book as people from the previous century - but there is a very good reason indeed to come here. 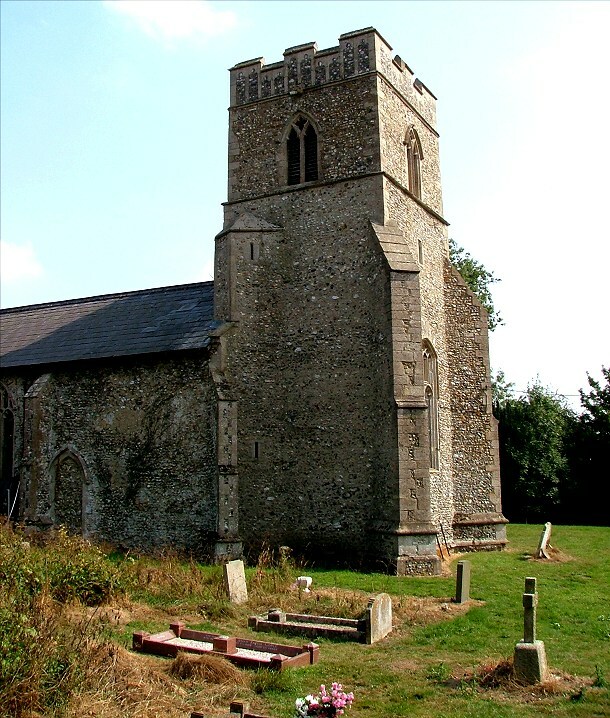 Wendling church has one of England's 40-odd seven sacrament fonts, some 25 of which are in Norfolk. 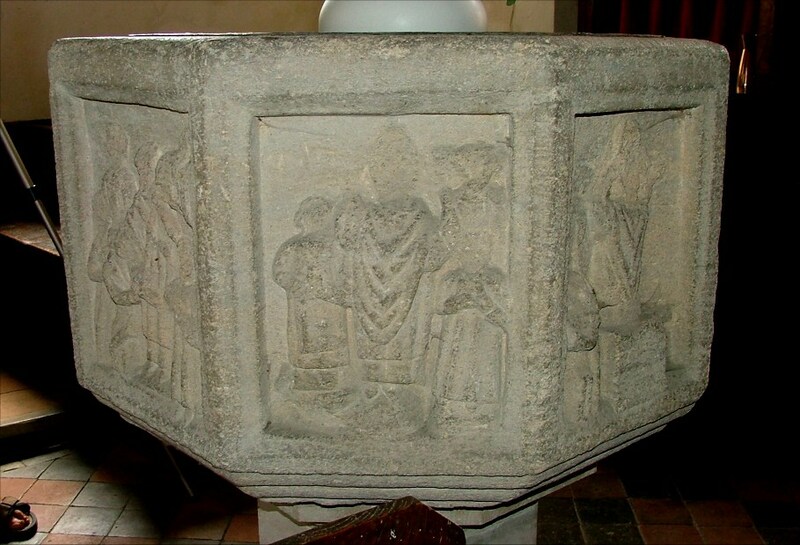 At the time of my visit, Wendling font was the only one of the series in the entire kingdom which was kept behind locked doors without an available key, so if you were a completist, and I am afraid that I am, this was the one that you were really going to have to work to see. I had already been here a month or so previously with Tom, and we had been able to do nothing more than rattle the doors a bit in a desultory fashion. 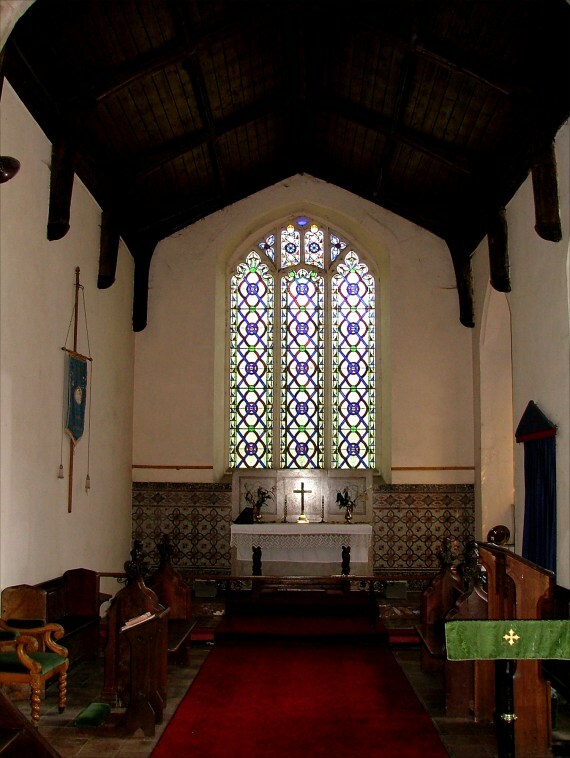 It is impossible to see the font through the windows, because they are filled with dense quarries of coloured glass, which, as it would turn out, don't look too bad at all from the inside, but which were of no help to me at all on that occasion. I had even begun to wonder if the church had fallen out of use. 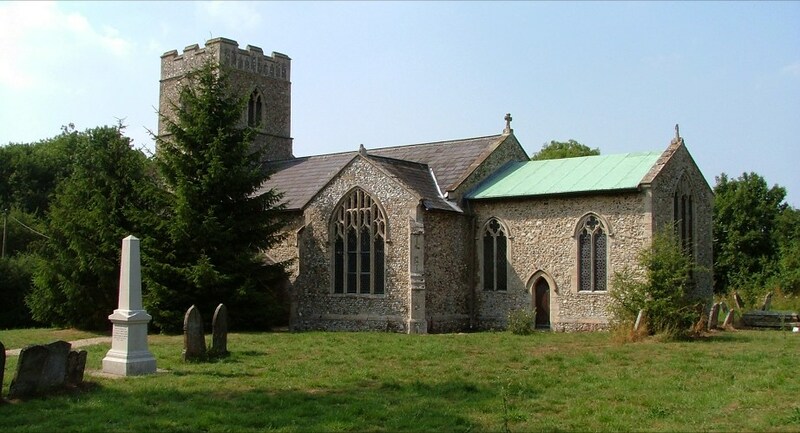 The Diocesan Directory listed no churchwardens, and the treasurer was way off in Gressenhall, four miles away, suggesting that hers was a benefice-wide occupation. I suppose that the idea should have struck me at this point, but it wasn't until my second visit to the area that it dawned on me. 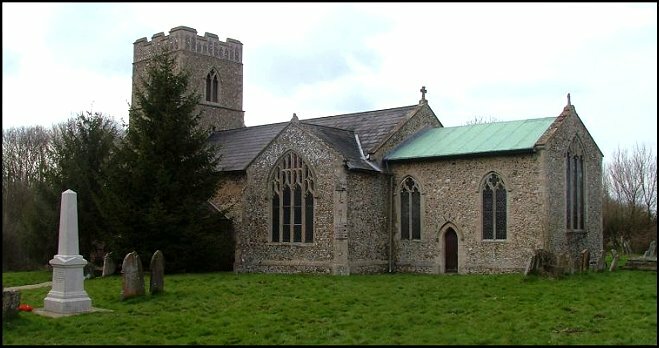 We were at Gressenhall church (also locked, no keyholder in those days - though I was with Chris Harrison, and he remembered where the key was kept) and I noticed again that Gressenhall and Wendling were in the same benefice. Gressenhall was a large enough village to have a resident Rector, so how about if we went and called on him and asked him for the key? This was easier said than done, even with the directions of the kind holder of the Gressenhall key. As it turned out, the Rector lived barely a hundred metres away, but it took us twenty minutes or so to find it. There was no sign outside saying Rectory or anything, which to be honest I was kind of counting on. I went and knocked on the door, planning as my opening gambit "sorry, I'm looking for the Rectory, can you help?" but the door was opened by a small, bearded man in clerical garb, and I knew that I had found it. Now, this was shortly after I had written another piece on this site about a wrangle with a Rector for a key (see Gaywood) and on that occasion I was threatened with a libel action, so I knew I would have to be careful how I reported the incident. However, he was very pleasant in a mild-mannered way. I explained the goal of my visit, and he nodded, but he didn't offer me a key. Instead, we arranged to meet up later that afternoon at Wendling, because he needed to be there anyway. Perhaps the idea of offering me the key simply didn't occur to him. Perhaps they just don't do that kind of thing around here. Fast-forward to 3pm. We arrived to find the door of the church wide open, a welcoming sight. We stepped inside, and there was the font. 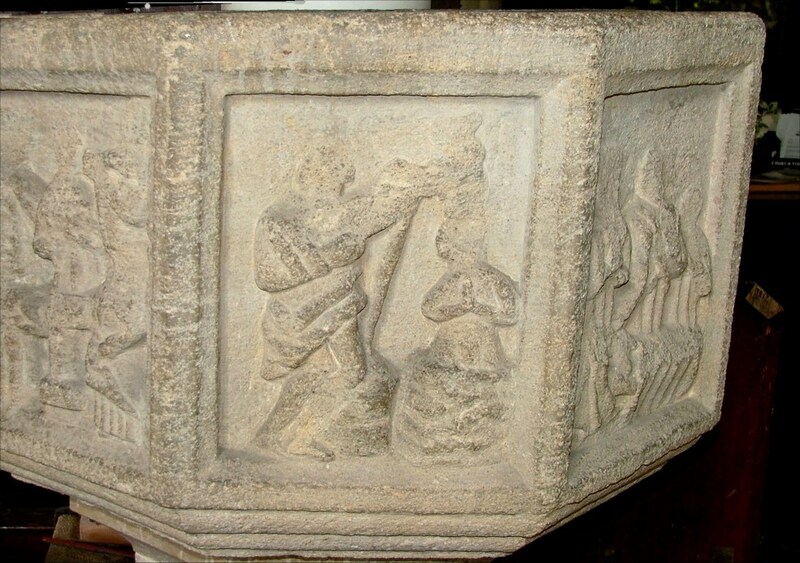 Wendling font is quite unlike any of the others in the series, because it has been carved with what appears to be a local hand. It may well even have been done by someone who saw the one at neighbouring Dereham, and thought to themselves, hmmm, I could have a go at that. If so, it is not a copy, but is in its way quite unusual. It may or may not have come from this church originally, but it is now set on a 19th century pillar. I see no reason to think that it was originally in the local Abbey church, because if it was then I think it would be of higher quality. That said, it is a fascinating and delightful piece of early 16th Century folk art. 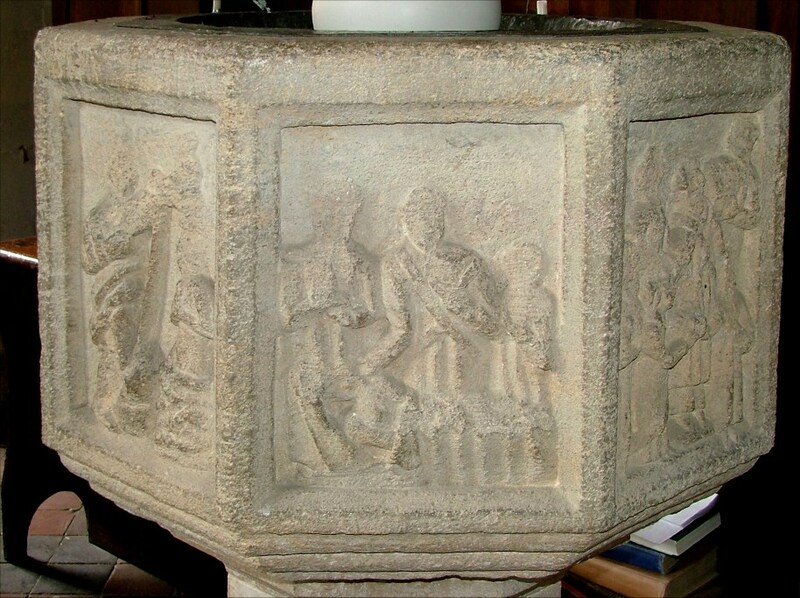 On church sculptures of this time you can sometimes see the beginnings of what would have been an immensely flowery, fruity English Renaissance - the 1544 font at Walsoken is a case in point. But there is nothing like that here. Pevsner says of it that it is badly preserved and probably never well-carved. Mortlock, a kinder man, observes that the font is notable for the crudity and engaging ham-fistedness of its carving. Seven Sacrament fonts were just one part of an attempt, from the middle of the 15th century onwards, to reinforce orthodox Catholic doctrine in the face of local superstitions and private abuses. There were several reasons for this. The Black Death had changed the English economic landscape entirely. The old estates were broken up, and the new landowners were a vigorous, money-making breed without the trappings of historic patronage. 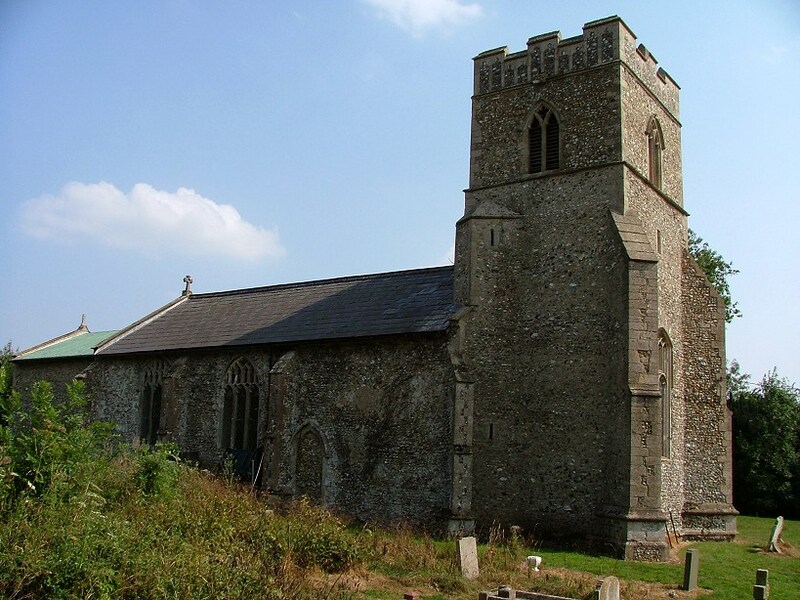 They gave large amounts of money to the Church, and in many places in East Anglia the church was completely rebuilt, sometimes on a vast scale. Here at Wendling, the transept was built at this time, and given the fine tracery in its window. The new rich wanted to assert their identity. They wanted to capture the imagination of the Parish. Going now were the days when the main function of a church was as a place for ordinary working people to carry out their private devotions. From now on, there would be focus - a church would become a place where people made a corporate act of worship, where sacraments were shared communally. A century or more before the English Reformation, benches began to appear, some of which still survive today. Pulpits were placed in the nave, and the Priest came down out of the chancel, making the whole church his own. The reward for this, of course, was the prayers of the faithful after death. By enforcing orthodox Catholic doctrine, the new landed gentry ensured that the people understood their religious duties and carried them out, including prayers for the dead. By bequeathing large sums in their wills for rebuilding, and for new fonts, screens, pulpits and the like, they ensured that those prayers for the dead were said for them. 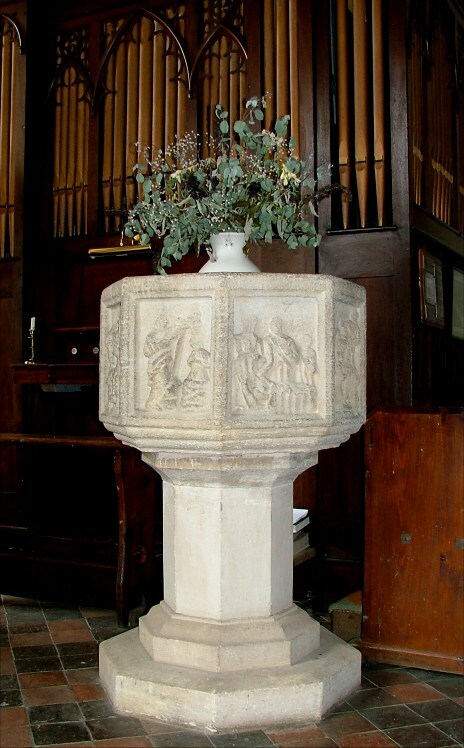 Wendling font is one of the last of the seven sacrament fonts in England. Probably only Walsoken is later. It is curious, then, that it does not look like the result of rich patronage. 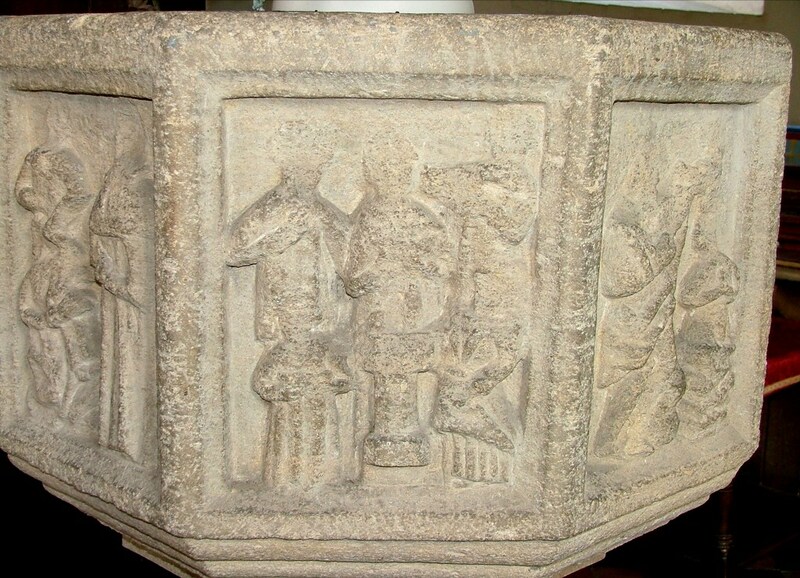 The panels of many other fonts are formulaic, as if there were a given way of representing the Mass, the Last Rites, and particularly Ordination and Matrimony. Here, that does not seem to be the case. Anti-clockwise from the east, then, we have Matrimony; unusually, the couple are kneeling with their hands joined. Ordination (NE) shows the Bishop with his back to us, and the ordinand kneeling facing us; I do not recall seeing this arrangement elsewhere. 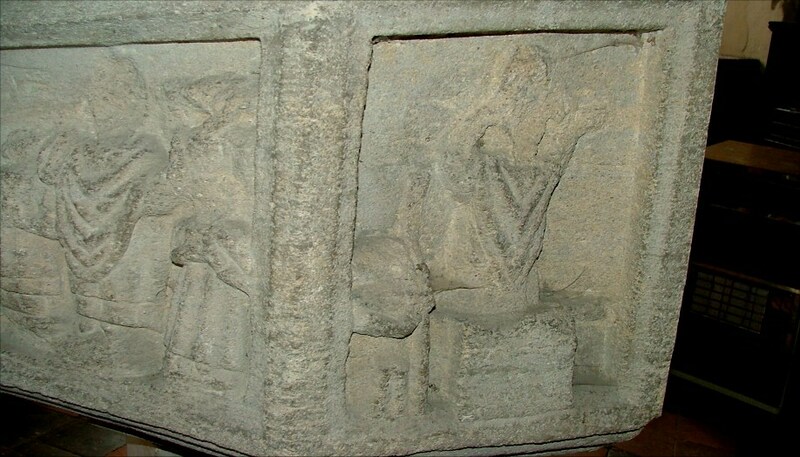 Mass (N) shows the Priest elevating the host behind a small stone altar; this panel is very close to the organ, and is difficult to see and photograph. 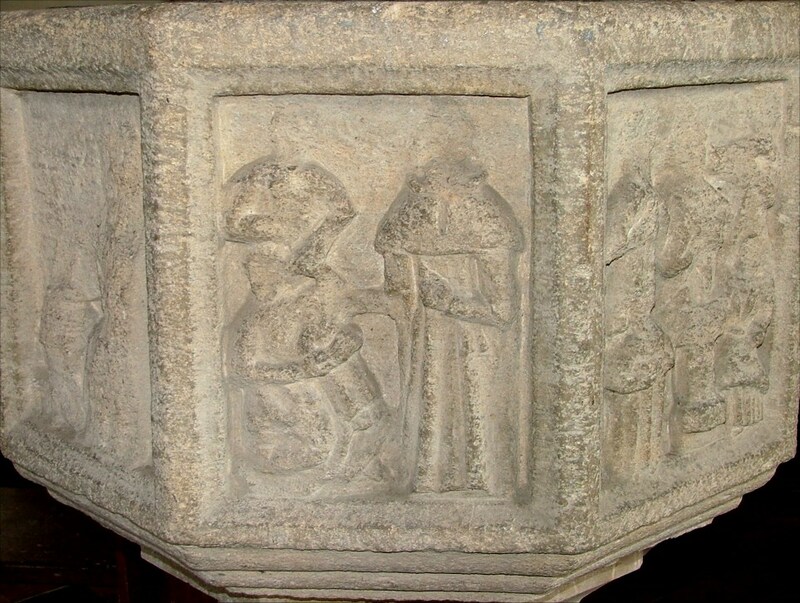 Next, Confession, (NW) it must be, but uniquely the confessor is shown standing giving absolution to the kneeling confessee, and this panel has been wrongly interpreted as Communion in one text. Confirmation (W) has been completely defaced. Baptism (SW) is the most conventional of the arrangements. 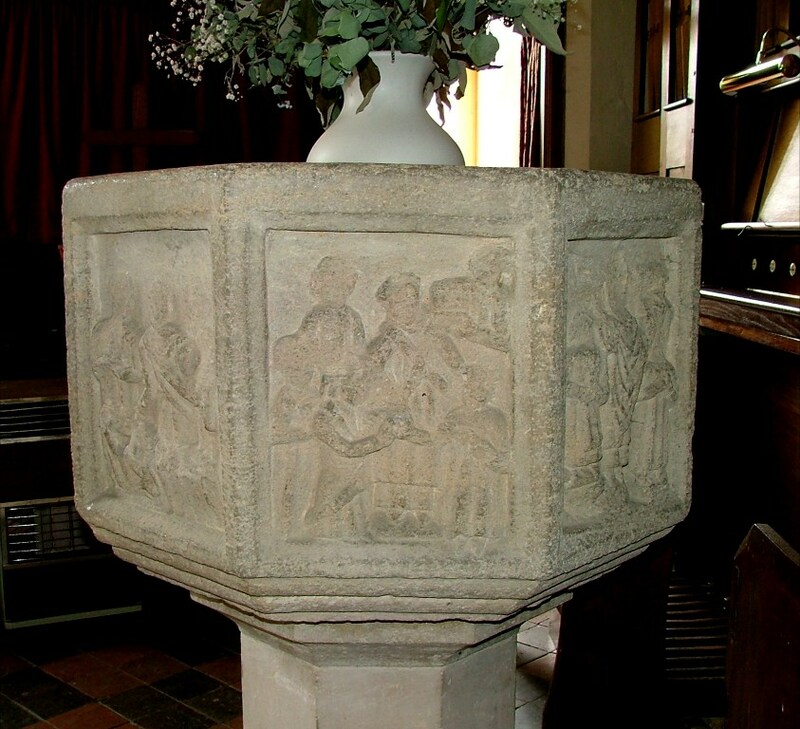 The odd panel out is the Baptism of Christ (S), perhaps the best of the panels, a dynamic arrangement where John confers the Baptism on a Christ standing in a pillar of water as a dove descends, as on the font at Fincham. Finally, Last Rites (SE) is conventional in its form, but very simply rendered, with the bed of the dying man low down in the panel and the Priest leaning over him administering the sacrament as two other figures look on. So, that was it, the Wendling font. And the church? Well, as you'd expect, a reasonably pleasant, Victorianised space, better kept than I had expected, but not looking as if it is used very much except for Baptisms, weddings and funerals, and the occasional Sunday service. 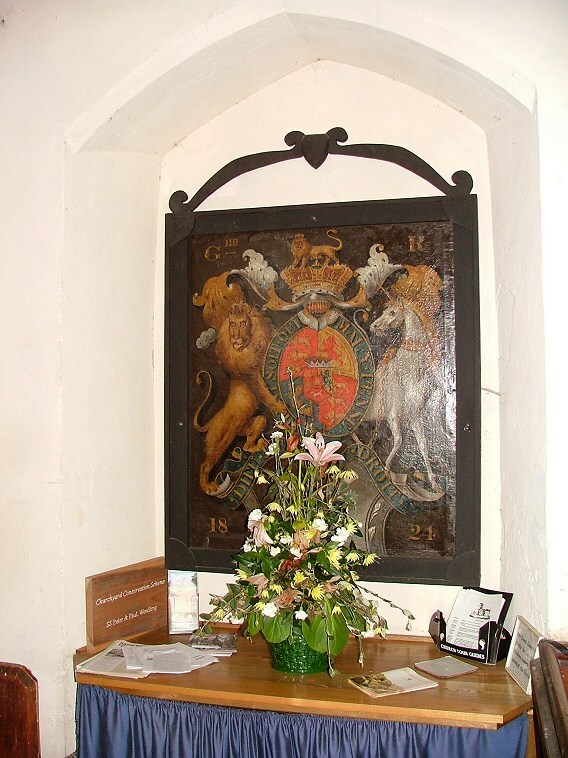 There is a fine royal arms of George III, redated and relettered to show George IIII, reset in the north doorway. And the Rector? As I say, he was pleasant, and seemed a very intelligent, studious type. I thought that he would be quite at home in the library of some Cambridge college. He was interesting to talk to about the font. To be honest, I felt a little sorry for him, and wondered if being stuck out here in the middle of Norfolk felt like a kind of exile. And so I didn't ask him why his churches were kept locked.